The exhaust may be hidden under the car but its functions are necessary for the safe and optimal running of the vehicle. transforms harmful substances to protect the environment (the catalytic convertor). The exhaust has a hard job to do and it is subject to severe temperature changes, snow, rain and corrosion due to salt and water. 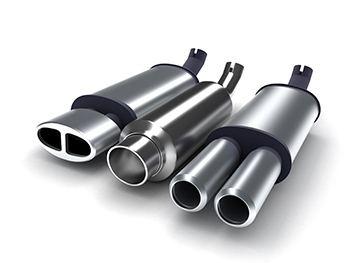 Corrosion of the exhaust system decreases the performance of your car, increases engine noise and fuel consumption. Having problems with the exhaust is also dangerous for you and for the environment. How often should I have the exhaust checked? Normally, the exhaust should be checked every three-six years, depending on the car brand and mileage. When you think there is a problem with the don’t hesitate to contact your nearest First Stop specialist for help and professional advice. We will assist you with the necessary repairs or replacements. How would I know if there is a problem with the exhaust? The main indicator of a problem with the exhaust is a change in tone and intensity of the exhaust noise when the car is running. If left without having it repaired parts of the exhaust system can fall off, which could be dangerous for other drivers on the road. The loud noise will also remain until you have it repaired.